Did you know that nearly 75% of the US population is suspected to be suffering from a mild to advanced form of periodontal (gum) disease? What’s worse is that many of them don’t even realize it. While this very common condition may start off seeming relatively harmless, untreated cases can quickly grow and threaten your healthy teeth and bone. That’s why our Roselle Park Dental & Implants team considers routine periodontal screenings absolutely essential for our patients. 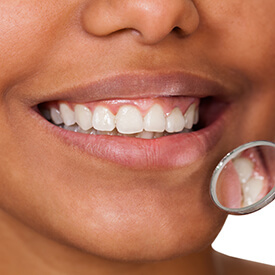 If we locate any signs of a troubling infection, effective therapy options are available to combat harmful bacteria and restore your oral health. Please contact our Roselle Park, NJ location today if you have any questions, or if you’re ready to schedule a first visit with one of our talented doctors. We’re happy to see the whole family! If you notice any of these problems, don’t hesitate in scheduling an appointment. The earlier we can start treating this condition, the better the results will be for your oral health and overall wellbeing. Scaling & Root Planing– This in-depth cleaning is performed with special dental instruments in order to remove bacteria and plaque from underneath the gum line (the “scaling” portion). Then, the rough tooth root surfaces are smoothed in order to promote healing and minimize the risk of further infection (the “planing” portion). Soft Tissue Laser Therapy– With our state-of-the-art soft tissue laser, it’s easier than ever to treat deep periodontal pockets, remove diseased tissue, and eliminate infectious bacteria from your smile. The focused light energy is far superior to traditional scalpels, promoting healthy tissue regeneration and greatly speeding up the healing process while minimizing post-operative symptoms (like bleeding). Antibiotic Therapy– Antibiotic therapy is often recommended as a supplement to the above two procedures, helping to effectively kill any remaining infectious pockets of bacteria that may have been initially missed.